This paper examines the diverse nature of user reactions to information technology (IT) within the social-historical context of its organizational use. Employing activity theory as a conceptual framework, we conduct an interpretive analysis of physicians work, perceptions, and IT usage experience at a large community hospital to understand why some of these physicians were favorably disposed toward IT use while others were not. 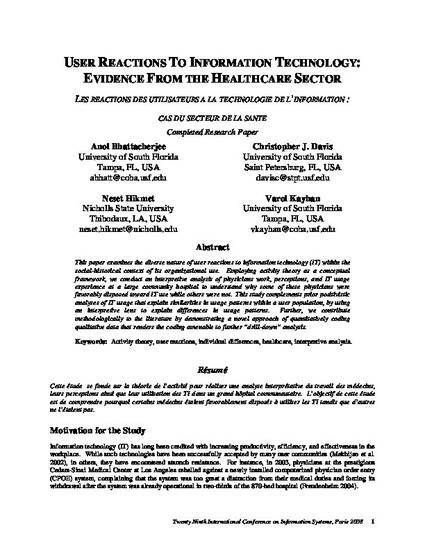 This study complements prior positivistic analyses of IT usage that explain similarities in usage patterns within a user population, by using an interpretive lens to explain differences in usage patterns. Further, we contribute methodologically to the literature by demonstrating a novel approach of quantitatively coding qualitative data that renders the coding amenable to further “drill-down” analysis.